TAA is an active bet where asset classes with superior performance potential are overweighted at the expense of those with inferior prospects. Successful TAA – or market timing, which amounts to the same thing – requires skill and is, of course, a legitimate way to generate alpha. But, as shown in the previous post on alpha, we have to differentiate between truly tactical active bets and persistent strategic biases. The example above obviously represents the latter. Actively managed balanced portfolios invest in a number of asset classes with benchmarks that consist of a series of indices that represent those asset classes with fixed weights. The investment manager has a whole hierarchy of active decisions at her disposal. She can (1) set asset class weights that deviate systematically from the benchmark weights, introducing what I call systematic bias, (2) engage in tactical allocation bets by under- and overweighting certain asset classes for a limited time, seeking to generate alpha, and (3) take any of the various types of bets within asset classes as discussed in the previous post. Note that both systematic bias and TAA may involve asset classes that are not included in the benchmark. As an example, if an equity manager with a pure equity benchmark holds cash voluntarily, i.e., beyond the level needed for the effective management of the portfolio, she engages in market timing. Many managers reject the notion that they might be subject to strategic biases. Instead, they insist that what I mistakenly interpret as their strategic biases are really long-term tactical bets. It is true that there is no clear boundary between strategic bias and long-term tactical bets. But I find it difficult to accept that biases that survive an entire economic or market cycle should be considered as legitimate tactical bets. Therefore, when we look at the long-term track record of a multi-asset class product, any significant deviation of the average asset class weights from their benchmark weights should be considered as evidence of strategic bias. We shall return to the question on how to determine these strategic asset class weights later. Pursuing biases requires no skill. Anybody can recreate – replicate – such a position. Therefore, for a multi-asset class portfolio, what we called the replication portfolio must include the impact of these biases. Formally, the replication portfolio includes all asset classes in the portfolio, both those that are part of the benchmark and those that are not, with the weights set to their strategic weights. 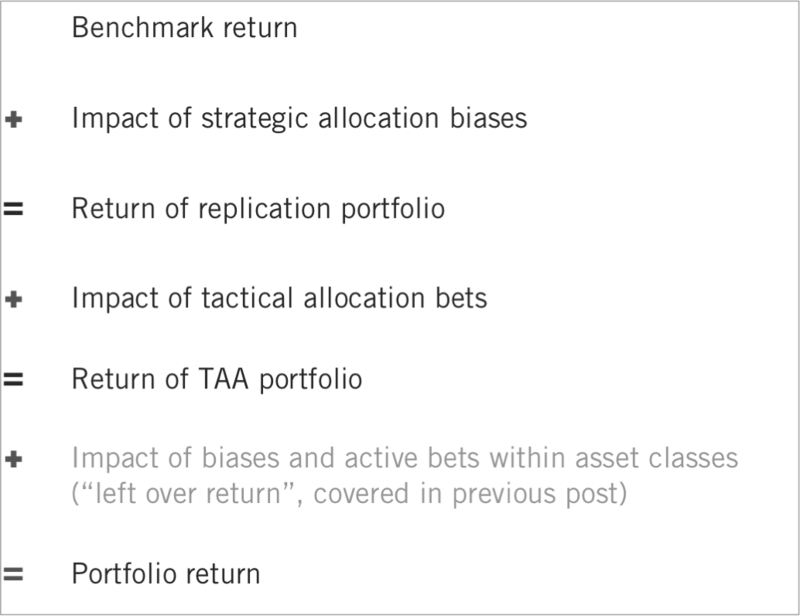 Thus, the impact of the strategic allocation biases on performance is simply the difference between the return of the replication portfolio and the benchmark return. Naturally, this impact may be positive or negative, i.e., a manager’s strategic biases may add to or subtract from the performance of the portfolio. Given the definition of the replication portfolio, it is the natural basis for the evaluation of a manager’s tactical allocation skill. Consequently, the alpha derived from TAA should be measured relative to the replication portfolio and not relative to the benchmark. Note that I use the term replication portfolio in two different contexts: in the previous post, it was a single asset class portfolio that captures all strategic biases in terms of risk factors, geography, etc. ; here, it is a multiple asset class index portfolio whose weights capture the strategic allocation biases. At any point in time, the sum of all timing bets, i.e., the total deviation of the actual weights from the replication portfolio weights, must be zero. For any overweight, there must be a corresponding underweight. In order to add value, a manager must therefore overweight those asset classes that do relatively better than those that are underweighted. To isolate the impact of TAA on portfolio performance, ignoring all active bets within asset classes, we construct a portfolio in which all asset classes are represented by their indices with weights equal to the actual portfolio weights and compare its performance with that of the replication portfolio. I call this portfolio the TAA portfolio. Formally, the value added or subtracted by TAA equals the sum over all asset classes of of the product of the difference between actual and replication portfolio weights and the return of the asset class index. For traditional approaches to TAA, this value added or subtracted is likely to be mostly skill-based alpha. For strategies that include important positions in options and other asymmetrical derivatives or are based on momentum or mean reversion models, the analysis becomes more complicated. But this is a topic that is best left for the next post in this series that will deal with alpha in hedge funds and other alternative products. Note that traditional performance attribution models insist on assigning TAA gains and losses to individual asset classes. But given the zero sum nature of active TAA bets, this makes little sense. If I overweighted equities in a 50/50 equity-bond portfolio, splitting the impact between the two asset classes is a nonsense given that I took a single decision. The impact of TAA on portfolio performance should be analysed in its entirety and not decomposed arbitrarily. So far, we have decomposed the performance of a balanced portfolio into replication portfolio return and the added value from TAA. What is left over is the sum of the impacts of all active decisions that are not related to allocation decisions. As discussed in the previous post, this will include active bets and biases within asset classes but may also include the impact from currency and similar overlays. I have collected all the formulas for the calculation of the various measures in an attachment (download the pdf file). The formulas are quite simple but as will be discussed below, it is unlikely that all required data are available. As an example, equations (2) and(8) would require access to a complete history of detailed performance attribution data. Also note that all formulas are based on arithmetic return differences even though geometric differences should be used in practice to ensure that long-term results compound correctly. The table below shows the basic relationship between portfolio, replication portfolio, TAA portfolio and benchmark returns. One result is noteworthy. The combined impact of strategic bias and TAA is independent of the definition of the replication portfolio (as seen in equation (7) of the attachment). Investment managers will have an obvious interest in arguing for a replication portfolio that adds little to performance so that most of the active performance will be considered alpha. On the other hand, this result also means that the “left over” part of the value added can be determined independently of the definition of the replication portfolio. I chose not to have a time subscript on the strategic weights u (in equations (3), (5) and (6) of the attachment), treating them as constants. An alternative would be to consider the systematic deviation from the benchmark weight as a constant instead. Actually, this second approach captures the spirit of strategic bias better as it defines bias directly as a systematic over- or underweight. Obviously, for balanced benchmarks that have fixed weights, i.e., are rebalanced regularly, the difference between the two definitions is likely to be rather small. In any case, the definition of the strategic weights will always involve an element of judgment. There is no single correct set of strategic weights for any portfolio; a degree of arbitrariness will remain – and thus room for disagreement. But this is just one of the issues that we face when we try to separate alpha and bias in practice. We already mentioned that, while the formulas in the attachment are quite simple, their implementation requires a large amount of data. These include a complete set of asset class weights for both benchmark and portfolio as well as performance data for asset class indices. Unfortunately, it is not realistic for any outsider to hope to be able to obtain this information. As a result, we usually need to use Sharpe’s regression approach – where we extract estimated asset class weights from a time series of portfolio returns – in this case as well. Recall that it is an estimation method and that all results should be viewed with a great deal of skepticism. One fundamental practical difficulty is the choice of the length of the interval over which we perform the calculations. If it were available, we could use daily return data. In theory, this should lead to very precise results. But since the analysis is based on estimated data, that precision is likely to be an illusion. But if we use monthly or quarterly data, we will not capture the impact of any TAA changes made inside the period since the formulas keep the beginning-of-period allocation unchanged throughout the entire period. Thus the short-term impact of intra-period TAA changes will be mistakenly assigned to the “left over” category. Note that this category is also charged with all trading costs associated with allocation changes since we measure the impact of strategic bias and TAA skill using index data that ignore transaction costs. The simplest way to set strategic asset class weights is obviously to extract the average weights from the regression analysis. As we shall see further down, that may be appropriate for products whose characteristics remain largely unchanged through time. But if there are changes in the investment universe or in the benchmark, further analysis may be required to ensure that the replication portfolio captures a significant part of the asset class exposures of the product. Clearly, given these obstacles, untangling bias and skill will never be an exact science. But it is nevertheless possible, using a simple set of tools, to improve our understanding of a manager’s style biases and skill and to have a clearer sense of the principal sources of her active performance. The complex practical problems associated with bias and alpha of balanced portfolios are perhaps most easily explored in the context of an example. 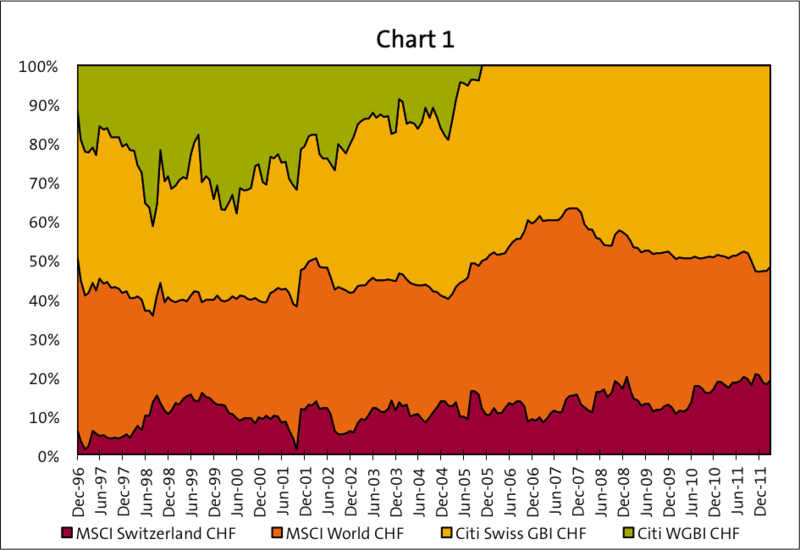 My choice is a traditional Swiss balanced fund with a long track record going back to 1993. The only historical numbers that I have access to are the fund’s monthly returns. For the past 15 years, its annualized net performance has been 1.9 percent. The fund’s current benchmark is a complex custom benchmark including high yield bonds and emerging market debt. It is likely to have been quite different some years ago. For lack of a better alternative, I assume that the fund started out as a traditional Swiss balanced portfolio concentrated on just four asset classes: Swiss and global equities and Swiss Franc and foreign currency government bonds and with a total equity weighting of between 40 and 50 percent. For such a product, the Pictet LPP 40 index is a suitable benchmark. It has an equity weight of 40 percent and about 60 percent in Swiss Franc assets. Over the past 15 years, it has returned 4.0 percent p.a. We cannot know what asset classes were included in the portfolio over the past nineteen years and what their weightings were. Consequently, we have to apply Sharpe’s regression method to estimate portfolio weights. We might be tempted to run a very complex regression including all imaginable asset classes but, as I pointed out in the previous post, this is likely to lead to serious multicollinearity problems with estimates of little value. It is preferable to start with a smaller number of asset classes and apply a heuristic trial and error procedure to add or eliminate asset classes. Obviously there can be no guarantee that we will capture all relevant asset classes and risk factors that have made significant contributions to portfolio performance. I will stick to the four classic Swiss asset classes mentioned above as potential components of the replication portfolio. I consciously ignore emerging market equities and debt, corporate bonds as well as any regional bets inside the equity and fixed income parts of the portfolio and, last but not least, cash. This means that while the “real” replication portfolio would have some exposure to those asset classes, ours will not. As a result, we will underestimate the return of the real replication portfolio and, consequently, overestimate the value added from TAA. We regress the monthly portfolio returns on the four asset class returns (using a 36-months sliding window) and find the following estimates for the average asset class exposures: Swiss equities 9 percent, global equities 40 percent, Swiss Franc bonds 50%, foreign currency bonds one percent. These averages are calculated based on the monthly estimation results as shown in Chart 1. I will apply no corrections to these results and consider these averages as the weights of the replication portfolio even though the foreign currency bond weight seems unreasonably small. Chart 1 shows that the estimated foreign currency bond exposure gradually disappears. We know that there are still foreign currency bonds in the fund, but they are mostly emerging market debt and corporate bonds whose behavior is not well captured by the government bond index used in the analysis. Consequently, this exposure is somewhat randomly allocated to one of the other three asset classes, most likely Swiss Franc bonds. We should now go back and repeat the exercise with some additional asset classes to search for a better, more realistic estimate of the replication portfolio. When we compare the characteristics of the fund and the LPP 40 index, we find that they share some important characteristics: the average equity content is 50 percent for the fund (according to our estimates), 40 percent for the index; fund and index have identical Swiss Franc exposures of 60 percent; and the volatilities of 7.1 percent for the index and 8.8 percent for the fund are also reasonably similar. However, the fund should have found it easy to beat the index given its freedom to invest in riskier asset classes. Instead, we have to explain an underperformance of 2.1 percent. When we apply equation (3) of the attachment to our (highly inadequate) replication portfolio, we find that it returned 4.1 percent p.a. compared to the index’s 4.0 percent. 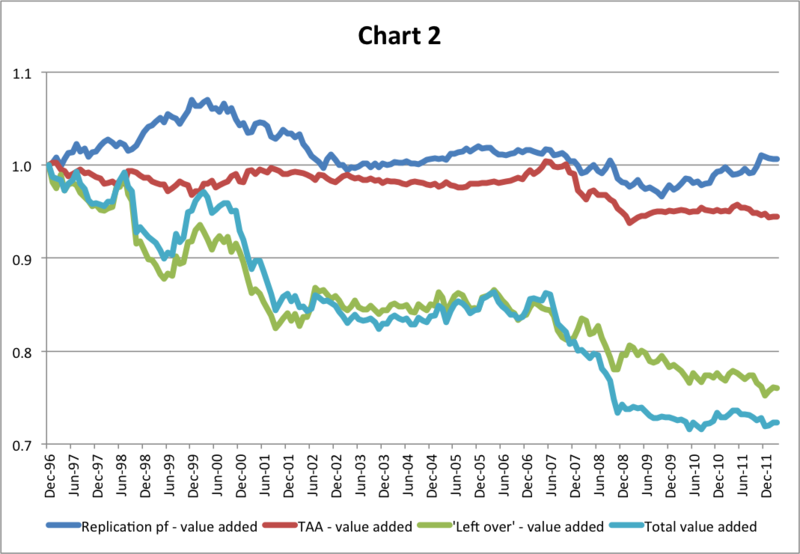 See the dark blue line in Chart 2 for the time series of the value added of the strategic allocation bias. The impact is surprisingly small. There are two very different possible explanations for this. Either the manager did not deviate much from the traditional allocation of Swiss balanced funds and/or our replication portfolio is poorly specified. Given the way in which I constructed the replication portfolio, the second explanation is likely to be correct; including the riskier asset classes would have led to a much better performance of the replication portfolio. We can now use the estimated monthly allocations from chart 1 (which are based on 36-months estimation periods) to determine the value added from TAA relative to the replication portfolio on a month-by-month basis (using equations (4) and (6) of the attachment). For the entire period, we find that the TAA activity led to a modest loss of 0.4 percent p.a. (before costs). The red line of Chart 2 shows the time series of the TAA alpha. The total impact of strategic bias and TAA is -0.3 percent p.a. If our conjecture about the understatement of the replication portfolio return is correct, the loss on the TAA activity would be correspondingly greater. In any case, there is no evidence of great allocation skill. For this fund, the “left over” part dominates active performance. It amounts to -1.8 percent p.a. but recall that it gets burdened with all cost elements (the fund’s total expense ratio is 1.7 percent). The green line in Chart 2 shows that the losses were greatest in periods of market stress. These results are quite intuitive. Chart 1 suggests that tactical bets were typically quite small. Thus, the potential for a significant TAA alpha was limited and the adjustment costs of TAA changes are a heavy drag on performance (but are falsely attributed to the “left over” bucket). In addition, managing a traditional balanced portfolio is a very complex process: changing the tactical allocation while preserving the potential for generating alpha inside all asset classes while keeping transaction costs under control is an art that few master successfully. As mentioned above, a serious analysis of this fund would require several additional steps in order to improve the quality of the replication portfolio. My choice is quite inadequate – the good news is that the results (Chart 1) make that fact very obvious. Theory – Grinold’s fundamental law of active management – suggests that TAA is more “difficult” than stock selection since there are fewer decisions to be taken so that there is a smaller diversification effect. The very patchy track records of GTAA (global tactical asset allocation) products offered by some of the best known names in the industry suggest that the theory is largely correct. While balanced management is attractive in principle by offering maximum flexibility to the manager, almost no balanced portfolios generate skill-based TAA alpha net of costs. The few that do tend to take bigger tactical bets and exercise a great deal of discipline in their implementation. But, from an investor’s viewpoint, it would be very useful to have access to great TAA managers. There are fewer capacity issues with tactical allocation than with stock selection. Also, the alpha sources are very different – macro factors dominate. Personally, I would look for a product that focuses on TAA and nothing else. It might be either a (very aggressive) traditional fund that covers the tactical range of an investor’s portfolio using indexed funds as building blocks, an overlay product, or a mixture of the two. This post has tried to outline some of questions that we should consider when evaluating managers who claim to have skill in TAA. Their track records can tell us much about their biases and their skill, despite the imperfections of our tool box. Because of the obvious incentives, strategic biases will likely dominate the active performance of most managers. Fortunately, it is not overly difficult to identify and quantify the sources of these biases.